The world celebrates Global Wellness Day with the slogan “One day can change your whole life,”on the second Saturday of June every year as an international day dedicated to living well. Global Wellness Day is an entirely not-for-profit day, a social project created by volunteers dedicated to living well. The purpose of Global Wellness Day is to ask the question, even if for just one day, “How can I live a healthier and better life?”, to direct the thoughts of both individuals and society towards “living well” and to raise awareness. First celebrated in 2012, Global Wellness Day was established in Turkey as the “first” day dedicated to living well, and has now been accepted worldwide. Global Wellness Day has been officially celebrated in over 90 countries at 3000 different locations in 2016, reflecting its success. According to The World Health Organization, Wellness is a state of complete physical, mental, and social well-being, and not merely the absence of disease or infirmity. My vision of living well as a community, society, and a world in general is being happy, healthy physicals and mentally, and leave in peace with each other. My own living well mantra is love and mindfulness of my own body and mind and people around me. What is wellness for you personally? What would you do today to achieve your wellness? Wellness is the conscious development of the whole self. Embarking on a wellness journey is a process of searching for the appropriate “tools” to make you a healthier and happier human being, plus discovering your own effective methods to use these “tools” for continued growth and development. If you don’t know where to start, try the following 8 steps. You will improve your wellbeing step-by-step with one step at a time. Have a family dinner with your loved ones. Share the manifesto, the video or the whole article with you families, your friends, your neighbors, your co-workers or your communities and spread awareness about Global Wellness Day. Living well one day at a time and educating others about it is my mission. My belief and my passion is to educate, support and empower people to transform their lives and reach their optimal health and happiness. As a ripple effect, we can change our community, our nation and the globe to better place with peace, love, health and happiness as priorities. I am here for you if you need my support. Schedule a complementary transformational session here. On this Global Wellness Day I would like to present you a gift – “7 De-Stress Tips for Busy People” e-book. 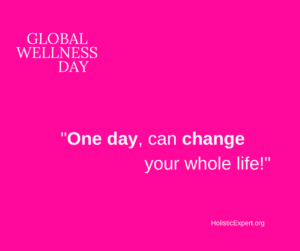 Let’s celebrate global wellness day! It’s the time to celebrate health and wellness.